A business dubbing itself the world’s first “doggy bar” will open in Aurora this month. Peter Kaufman, the energetic owner of Buddy’s Kitchen, likens the business to a Starbucks for canines. The difference at Buddy’s Kitchen is dogs and their owners won’t be dropping by for a designer-coffee boost, but a gourmet meal, which will feature locally sourced food prepared on site by a professional chef. 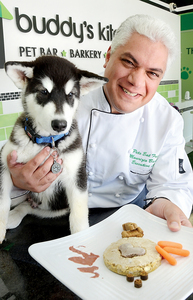 Mr. Kaufman’s vision for the Industrial Parkway South location would see first-time customers discussing their pet’s health and eating habits with staff before ordering an appropriate food for the dog. A meal could include appetizers such as carrots and special dog treats, a creatively designed main course platter consisting of patties made from salmon, beef, chicken and lamb and dog cookies for dessert. Customers can expect to pay $2 for a main-course patty and $5 for the entire meal.